'Stunning location...quiet but close enough to everywhere else as/when you needed it...spotlessly clean and well-equipped - and the most wonderful of views'. These are comments from a renter who enjoyed his stay in our flat which is within walking distance of the ski-lifts and the best nursery and intermediate slopes in Chamonix. 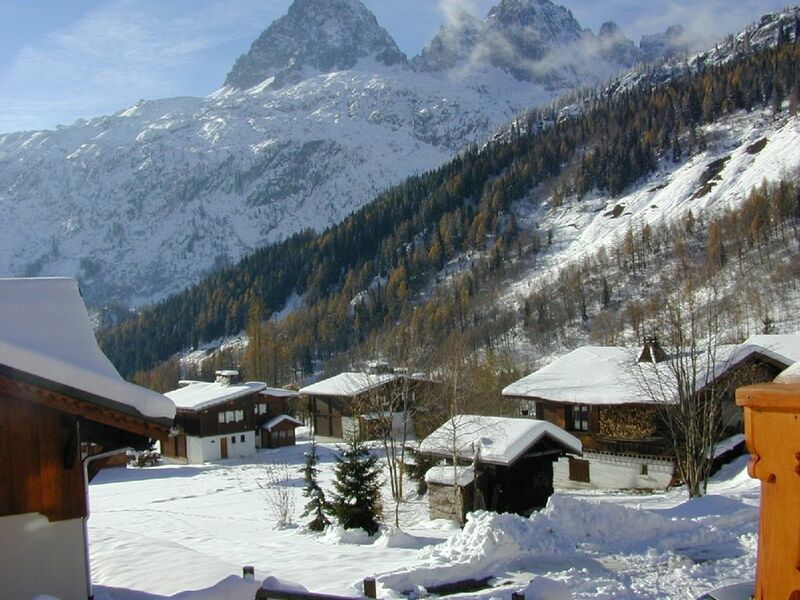 Argentière which has some of the best piste and off-piste skiing in the world is 5 minutes down the road, although many find the Le Tour slopes all they need for a week. Argentière also has a number of good restaurants and shops. The whole area is teeming with activities, both in summer and winter; a walker's paradise, ideal for family holidays and for those who just want to relax in a calm and peaceful atmosphere. May and June are great months to visit when the mountain flowers are appearing. Le Tour is also very well placed for visiting Switzerland (10 mins), Italy (30 mins), and Annecy and Geneva (1 hour). Lock-up garage and plenty of outside parking. Le Tour has more sunshine than any other part of the valley. Summer activities in Chamonix include summer-tobogganing, canyoning, white-water rafting, ice-climbing, mountain biking, and adventure trails up in the trees; and sometimes you can't see the sky for the parachutists. Take the train to visit the inside of the glacier, or from Le Fayet to the nearest you can be transported to the summit of Mont Blanc. Chamonix is the European centre for mountaineering and has a very good climbing school. In the winter the skiing is famed world wide and the area has over 600 kms of pistes and 200 lifts. Argentière has some of the best off-piste skiing in Europe. Le Tour has excellent nursery slopes and good intermediate skiing for the whole family. It is in a beautiful and very quiet area but close to a large and busy town. There are all-year round activities from skiing to whitewater rafting and golf and tennis among many others. Amazing views and the best ski slopes in the world, yet a very quiet location well served by public transport. PLEASE NOTE THAT I DO NOT CHARGE EXTRA FOR CLEANING. IT IS INCLUDED IN THE RENT. BUT I WOULD APPRECIATE GUESTS LEAVING THE APARTMENT CLEAN AND TIDY. Bathroom 1 has a bath, shower, and basin. Bathroom 2 has shower, basin, and lavatory. I stayed in this chalet-apartment for one week at the height of the season in February. Everything was very positive, with no surprises. Location was good, in Le Tour, a ten-minute walk from the Col de Balme Ski-lift, and a short bus-ride to Grands Montets. I was there with my family for the skiing and all went according to plan. Very positive experience overall, and I would recommend to anyone considering a break there. Thank you very much for your kind review. I am pleased that your holiday went well. We recently had a very comfortable stay in this apartment. John Hart, the owner, is very genuine and lovely. Aude, who looks after your stay in France was also very lovely and helpful. The log burner is a real treat after a day in the snow; although I recommend only one log at a time as I have never seen such an efficient burner. Beds are really comfortable. The kitchen and apartment are very well equipped – although I could never work out how to use the microwave – either as a microwave or an oven. The instructions are all in French which to my shame left me stumped – so oven hob was the way for me! The internet speed is very good also. The apartment, as John points out in his pre stay e-mails, is also their family home, and certainly we felt the benefit of being in a home, and not just a rental apartment, with comfortable and cosy chairs to snug into when watching an evening DVD with the fire. The use of the garage is a bonus. Especially not having to clear snow off the car. Only word of caution – if you are over 5’8, watch out for the casing above the top of the stairs. I would certainly love to stay again. I also suspect that summer must be wonderful, with the balcony looking towards Mont Blanc and the garden. Even in February – on a sunny day – the balcony was wonderful to sit on. Thank you very much for your nice review. The microwave instructions in English should have been on the top of the microwave unless someone had moved them. Even in English the instructions are difficult to follow. I will try and include them in the batch of information I send out. I am very pleased that you had a good holiday. Le Tour is a small hamlet at the head of the Chamonix valley. It is just off the road to Switzerland which is about 8 minutes drive away. 5 miles from Chamonix and 2 from Argentière, Le Tour has good pistes for different levels of skiing. Argentière has some of the best on-piste and off-piste skiing in the world. The full ski-pass allows you to ski in the whole of the Mont Blanc region, including Courmayeur.. There are several mountain restaurants and Vallorcine can be reached either by skiing down a path or by cable car and you will be rewarded by a good lunch at La Bougnête. Martigny is 20 minutes away in Switzerland and Verbier a further 20. Spring is a good time to go to see the flowers beginning to bloom, and summer is perfect for walkers, climbers, and mountain cyclists. Ski: Le Tour has lifts near the chalet servicing the ski area which is ideal for beginners and medium skiers. There is 1 black run for the advanced skier. The area is quite extensive and there are some lovely runs through the trees and also above the tree-line, A lift connects Valorcine to the ski area. From Charamillon there is a chair-lift which goes to the Col de Balme.